Here is another angel project. 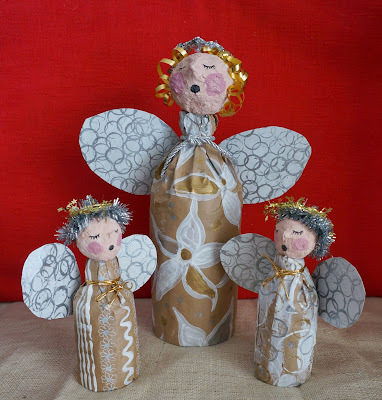 The unique thing about these angels is that a bottle, (recycled water bottle, pop bottle) forms the base. You can make small or large ones depending on what's in your recycle bin. Take your bottles and cut off the bottom. I poked a hole first with my awl so I could get the end of my scissors in and then cut. Cut your paper into rectangles that are 4 inches taller than the height of the bottle and long enough to cover the bottle with a 2 inch overlap or so. If using plain paper (kraft, newspaper, etc) paint designs on the paper. You can add details in markers, pencil crayons, and glitter glue. I used a Styrofoam ball as a base for my head. You could just use it straight, or add a layer of papier mache or air dry clay. 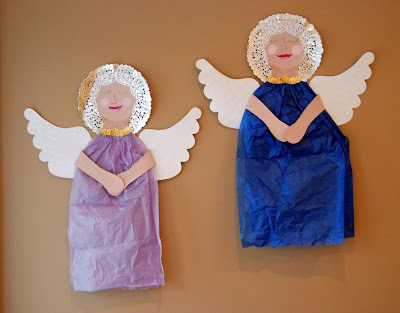 You could also roll up some paper or foil into a ball and cover it with papier mache or air dry clay. I used paper clay to coat my head. I made a small nose as well. To hold my heads while they dry I used a piece of cut paper roll an a piece of wax paper to stop it from sticking. It needs to dry overnight. 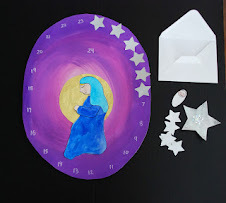 Take your decorated paper, flip to the unpainted side. Place the bottle on the paper. Using tape stick the paper edge to the bottle. Wrap the paper around the bottle, there should be enough for some overlap and glue together. I used an elastic band to hold the paper on the bottle while the glue was setting up. Take the excess paper at the bottom of the bottle and fold up tucking it into the opening. Do the same for the top of the bottle. You can wrap the neck of the bottle with a piece of string or decorative cording. I made the wings from thin cardboard. You can cover them with fancy wrapping paper or paint them like I did. The coloured side of the cereal box took 2 coats of paint. I used a cap from a spray bottle to print circles all over the cardboard in silver paint. When my heads were dry I painted them with a flesh tone, added some pink cheeks, eyes and mouths. Glue on some ribbon or garland for hair. I wrapped some star garland into a circle for halos. Glue the head to the top of the bottle. Cut the wings out of the cardboard. I used a teardrop shape. 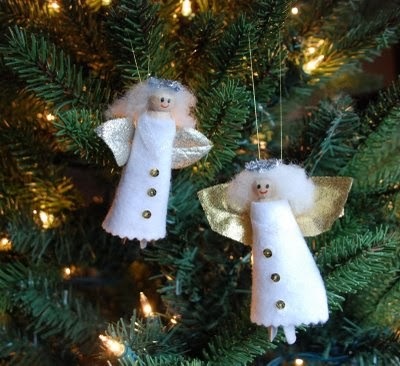 I used a glue gun to stick them on the angels. I put glue on the point of the teardrop shape. Glue to the back of the angel. and that's it, angel completed. Make a set with different sized bottles for a nice display. 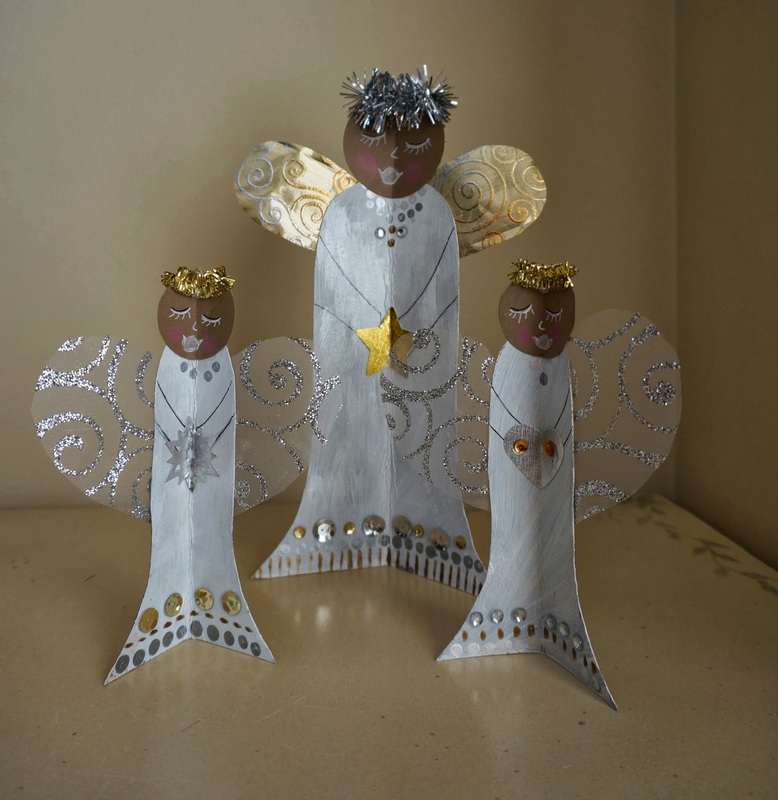 I have been making a lot of Angels this year for Christmas. 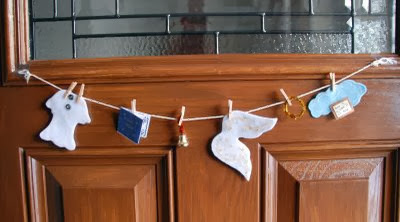 This one is quick and made from items you already have lying around your house. They are based on a fold so they stand on their own and could also be made into a card. A good way to fill in that corner or to decorate the table. I was going to include my template but I'm having issues with my scanner right now. As soon as I get it up and running again I will add them. It's basically a long bell shape. You want a nice straight line at the base so it will stand. When I made my template I folded my paper and drew only one side. I then cut on the fold so my design was symmetrical. 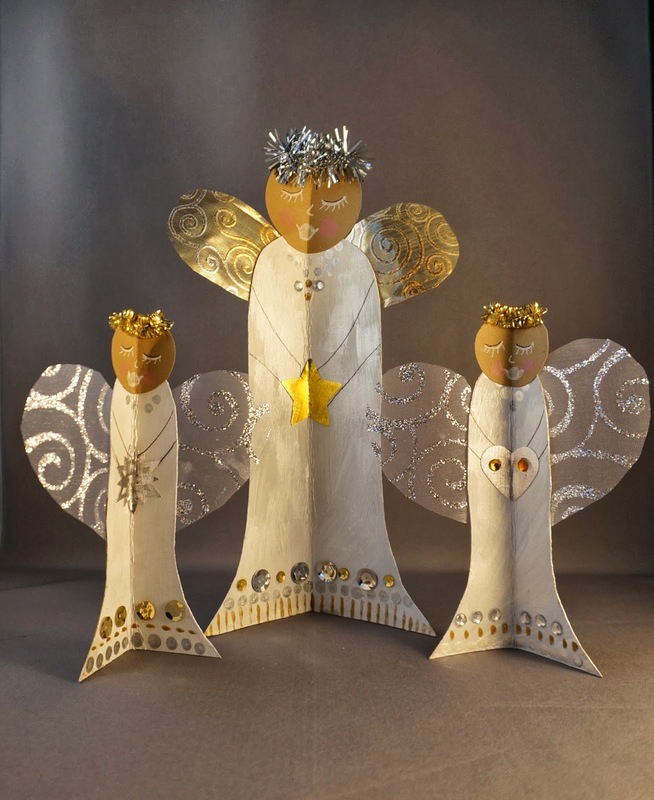 Trace onto your cardboard or heavy paper and cut out. 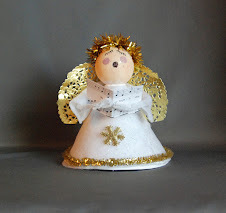 My large angel body is 7" high and the small ones are 4.5". Take the body and fold in half. You can use a bone folder or ruler to help. I decided to paint my angels but you could also cover them in scrapbooking paper or even wrapping paper. Just cut to size and glue on to both sides. I painted mine white. The colourful side of the cardboard needed 2 coats. I then dry brushed on some gold and silver paint on the back. I find metallic paint to be quite translucent so it helps having that white primer. It has a nice weathered look. To the front I added a thin coat of iridescent glitter glue for a little shine. I always brush on my glitter glue so I can just have a thin coat as it takes so long to dry! Now it's time to decorate the dress. 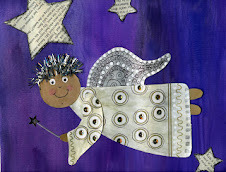 Using a small piece of cardboard dipped into metallic paint I add small lines. Dipping the end of my pencil in paint gives me dots. Draw on the arms in pencil first and then use some fine black sharpie. 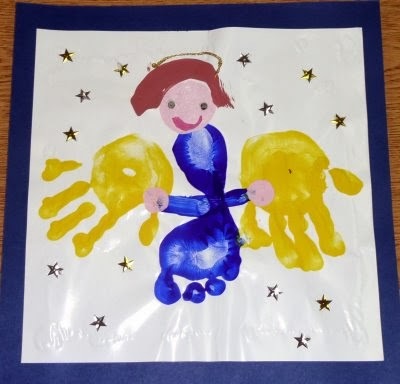 Instead of hands I have the angels holding a cut paper shape. I used my punches but you could easily just cut out a star or heart shape. I used foil scrapbooking paper but wrapping paper would also be nice. Fold the shape in half and then glue into place. Add some sequins or gems glued on with tacky glue. Avoid gluing these directly on the fold as they will just tend to fall off. Now it's time to add some wings. If your ribbon is wide enough you can cut both out in a single piece. It's a heart shape with long sides. I traced it on the paper so you could see the shape. If your ribbon is smaller just cut each wing separately. Glue onto the back of your angel. Time for the face. 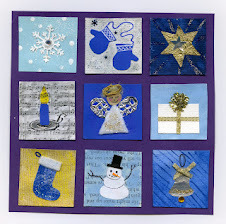 Using skin toned card stock cut a circle shape. Use a punch or trace around a circular object. Draw in your face using white pencil crayon or gel pen. 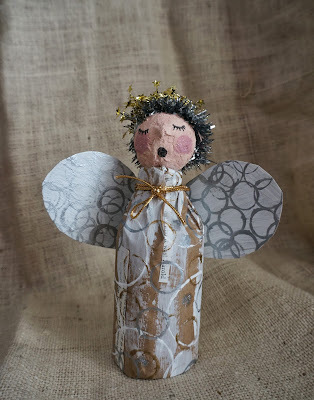 I like to make my angels singing with closed eyes. Use some pink pencil crayon for rosy cheeks. Fold the face and then glue into place. Finally add some hair. Using a scrap of garland glue into place on top of the head. 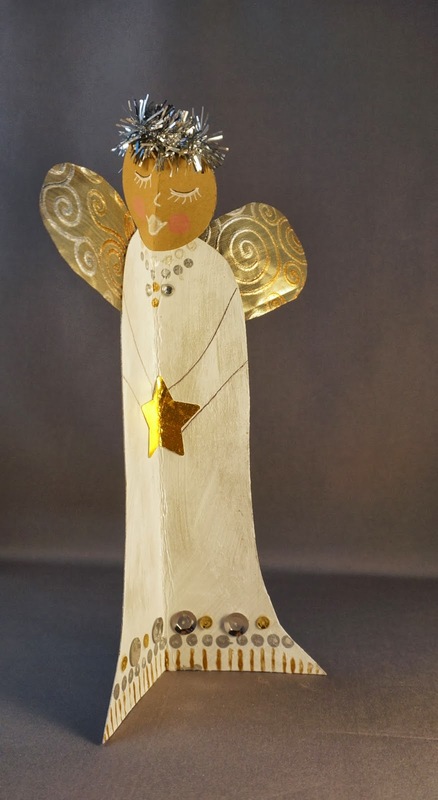 Find a nice spot for your angel to stand. You can also fold it up and put it in a card or have it be the card. More Angel projects on the way.